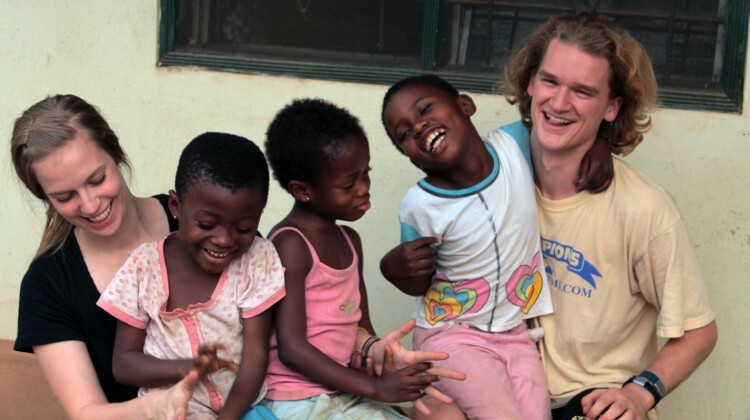 Yost and Matheson play with children in Kumasi, Ghana. This January, four Gustavus students traveled to Ghana to assist with care in a hospital, teach students about proper hygiene and learn more about medical care in a foreign setting. The students, junior biochemistry and molecular biology Major Alex Chubick, senior physics major Max Matheson, senior biology major Tom Ulsby, and senior biology major Anna Yost, traveled with connections from Africa Partners Medical. Yost, Ulsby, and Matheson after having observed their first surgery. 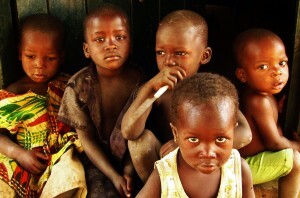 Africa Partners Medical exists to bring medical supplies and support to African students and hospitals. The student’s experience was very positive. “Ghana was more than I could have asked for. 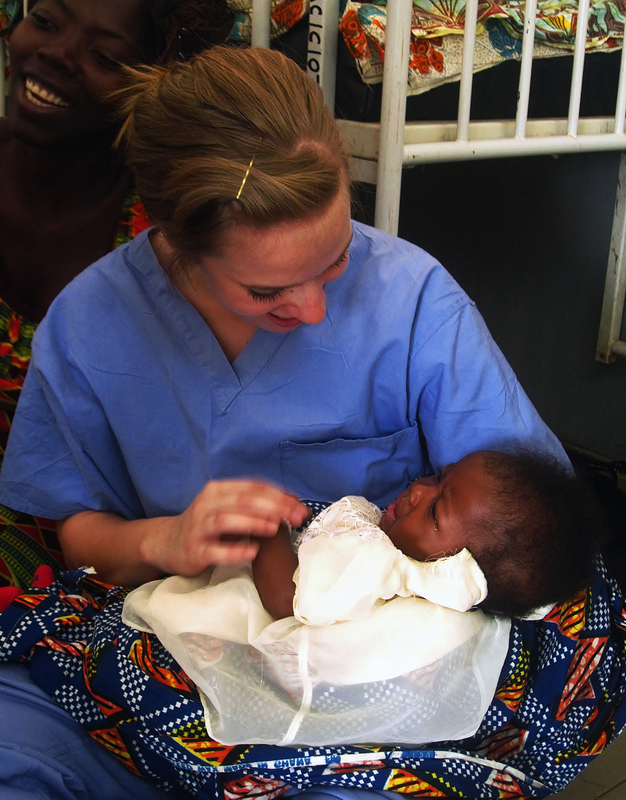 I was able to promote hygiene to young students, attend African church services, learn to draw blood, take children’s vitals, give immunizations to infants, and bond with babies, all while traveling in a place I’d only dreamed of going,” Yost said. The four Gusties began their trip meeting medical leaders and student groups in Ghana. They also presented lectures on hygiene, titled “Good Personal Hygiene,” to students in Kumasi, Ghana. “Hygiene issues are taught at a very basic level early on, but never reinforced. They needed help with basic stuff like showering and hand washing. We talked with two to three thousand kids total in five different schools ranging from nine to seventeen in age. The children were really interested and genuinely thankful. It was very rewarding and gratifying to see the effect on them,” Matheson said. Yost and Matheson answer questions about hygiene from Ghanaian students. Traveling throughout multiple countries, the students had an opportunity to see how people live in western Africa. “It’s such a contrast to anything around here. Moving doesn’t capture it,” Matheson said. The students spent the second part of their trip with Dr. Jean Young ’70, Medical Superintendent at Saboba Medical Centre in Saboba, Ghana. Dr. Young has been active in African hospitals for over twenty years. “She’s the only doctor in the hospital. It serves people from all over – some a two-hour drive. People from Togo even come over to get service, because their healthcare isn’t very good either. She’s always on call. She can do a surgery, get out, clean up, do rounds, go to sleep, and two hours later be called in to do a cesarean section. She’s an incredible woman,” Matheson said. Young allowed the students to follow her on rounds and do work throughout the hospital. “It was a lot of very hands-on experience that you would never get to do here in the states, which is exciting and scary at the same time,” Matheson said. Matheson draws blood from Yost, which will be tested for Malaria and Typhoid. The students learned how to conduct blood and urine tests for Malaria, Typhoid, HIV, pregnancies and more. They also learned how to draw and transfuse blood, and even look at it under a microscope. In addition, each student had a chance to explore areas of the hospital that sparked their interest. Ulsby learned about writing prescriptions and dispensing them in the pharmacy. Yost and Matheson explored the children’s ward and performed nurse duties there. Chubick gained experience working in the lab. “We got to essentially be special nurses and special lab technicians. Dr. Jean introduced us to all of the wards and workers. Everyone was really welcoming and helpful,” Matheson said. While the Gustavus students helped as much as they could, not all patients spoke English. “We tried as best we could. I tried to learn as much of the language as I could. 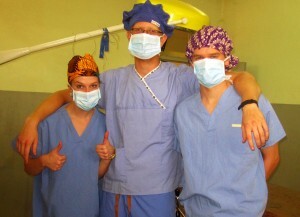 I was interested to gain not only the medical experience, but some cultural experience as well,” Matheson said. 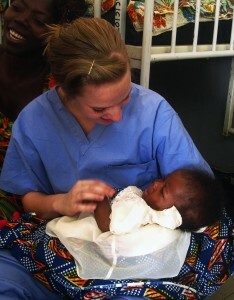 Yost comforts Gloria, a 4-month old baby girl of Aggie and Pastor Jonah, who became good friends with the students. Gloria was in the hospital during much of the group's time in Saboba, Ghana. Ghana is the seventh fastest growing economy in the world and features beautiful wildlife, yet lacks basic infrastructure in some areas. “There’s a lack of effective plumbing and electricity. Most compounds in the small villages do not have plumbing. The roads are poor and often washed out in the wet season. Cell phones are relied heavily upon, but service is highly unpredictable,” Yost said. For students who have experience in an American medical setting, an experience in a developing country offers a new perspective. “With the poverty level, difficulties in shipping, and acquiring medical supplies, it’s kind of like our 1950s hospitals. Sterility is still really important, but it’s nothing like going into a hospital here,” Matheson said. In addition to making medical supplies available, the students learned that educating residents and encouraging them to take advantage of services can be challenging. “In the bush, if an MRI or X-ray is needed, the patient must somehow get to the closest town with these technologies. That is, if the patient wants to. If the patient doesn’t want to go, there’s not much you can do about it. We don’t want to force our culture onto the Ghanaian people. We need to figure out how to mesh first world technology in with their beautiful culture,” Yost said. Matheson felt his experience in Africa has given him a new perspective on life. “The entire country is very welcoming. They appreciate every little thing, they aren’t obsessed with deadlines, if something doesn’t go perfectly, they move on. It has definitely given me a broader perspective on life, one that’s not so narrow minded and stereotypically American,” Matheson said. The students made connections in Ghana, and are hoping to make the trip an annual event, and that it will perhaps be offered as a January Interim Experience or semester study abroad opportunity sometime in the future.